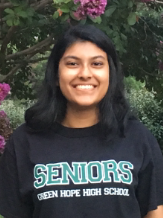 Priyanshi S Aeron is a senior at Green Hope High School. She is a part of National Honor Society, National English Honor Society, Tri-M Music Honor Society. Her desire of Volunteer has won her The Gold President’s Volunteer Service Award, Platinum Mayor’s Volunteer Award, and Commissioner’s Volunteer Award. She is a teacher at Kumon and loves to help other succeed in their academic goals. She prides herself fin volunteering at UNC Hospitals, Key Club, Beta Club, Rotary Interact and the Food bank. She has helped sort and assemble hundreds of meals. By volunteering at several Adopt-A-Highway events I have helped not only the community but the health and well-being of the planet. class="pirenko_team_member-template-default single single-pirenko_team_member postid-4126 samba_theme samba_left_nav samba_left_align samba_responsive ecwd-theme-samba wpb-js-composer js-comp-ver-5.4.5 vc_responsive"